I recently wrote about visual resumes, and asked recruiters on Linked In if they felt they would be more effective than a traditional resume or not, with mixed comments. 1 | The interface is intuitive enough to use without help – always a plus for never-before-seen-or-used software. 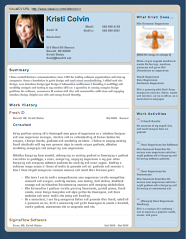 2 | The CV sections are completely customizable, draggable, and easy to add or delete. 3 | The presentation is nice and clean. Though I wish I could insert my own brand elements, the three options for the resume design are pleasant enough to look at. 4 | You can pack all the information a company or recruiter might ever need, into one nice page. 5 | Your resume can be shared, forwarded, printed or saved as a PDF. 7 | The nature of it being hosted for you online, plus the ease of editing, makes it a living document… change it any time you think of something that would make it better! 8 | Sending a link takes much less bandwidth in a talent manager’s inbox than a resume attachment. They can check it out, easily forward it, and let you know if they’d like more information or an electronic document. • The executive resume design bothers me. It doesn’t feel quite as “smooth” as the other two. • I didn’t see an option for recruiters to access a Word doc or plain text option, though you could add one to your portfolio and create a section for it or link to it. • There is either a bug, or a hiccup in Safari on the Mac, with the text being copied/pasted. It didn’t always come in at the same size, and I had to hit return and back up several times, to make it all the same size. A size option for the text would be a nice addition to the Bold, Italic, etc. options. And if you are a hiring manager or recruiter and would like to fill out my brief survey on whether or not a visual resume can be effective for applicants, please do! After your tweet about it, I started my visual CV too & really like this service. Like you I hope they’ll add some robust features. The ability to choose font & size, and accurate copy & paste would be great. I’d like to be able to include feeds as well. Pamir, thanks for your comments and for creating a visual cv – I’d love to see it when you finish. I was thinking about the font selection too – it would be nice to have a few options. How, and where in the product, would you like to see the feed working? I have this blog feed imported into Facebook, and my account over there, barely used, is already getting kind of cluttered up. I’ve not jumped into FB, don’t know if that’s good, bad, or a fad…Anyhoo, feeds would be nice on the sidebar of your visual cv. I’m thinking my blog, not my microblogs. It’s a cv, it’s visual and my flagship content says a lot about me. Then there’s the case where you may be a writer. Aaah… good point. Of course, you can put a little image like Guy did pointing them to your blog, but I wonder if the text container on the sidebar can hold html? If so, you could use something like FeedDigest (I have it on freshid.net) and bring in your feed that way now… OR you could create a list of links to your best posts in there. That would be a low-fidelity solution until they add more options.